Fort Mason Center for Arts & Culture (FMCAC) is pleased to announce Playtime, an ambitious exhibition of three recent video installations by award-winning British artist Isaac Julien. Each film installation explores the wide-ranging effects of how information, labor, and capital circulate in global, networked societies. Occupying three separate galleries on the FMCAC campus, the exhibition presents the U.S. premiere of Julien’s seven-screen installation, Playtime (2014), featuring a cast of international film stars, including James Franco, Maggie Cheung, and Mercedes Cabral. KAPITAL (2013), a two-screen companion piece to Playtime, documents the public discussion “Choreographing Capital,” which was held at London’s Hayward Gallery between the artist, social theorist David Harvey, and an audience of academic luminaries such as Irit Rogoff, Paul Gilroy and the late Stuart Hall. In addition to Playtime and KAPITAL, a third artwork by Julien will inaugurate the San Francisco Art Institute’s newly constructed Gray Box media gallery at FMCAC—Better Life (Ten Thousand Waves) (2010)—the cinematic cut of Julien’s monumental installation Ten Thousand Waves, filmed on location in mainland China. All three works have been generously loaned from the Kramlich Collection. The exhibition will be free and open to the public from December 1, 2017 through February 11, 2018 and accompanied by parallel public talks with the artist, and educational programming at UC Berkeley, SFAI, Mills College, and UC Santa Cruz. 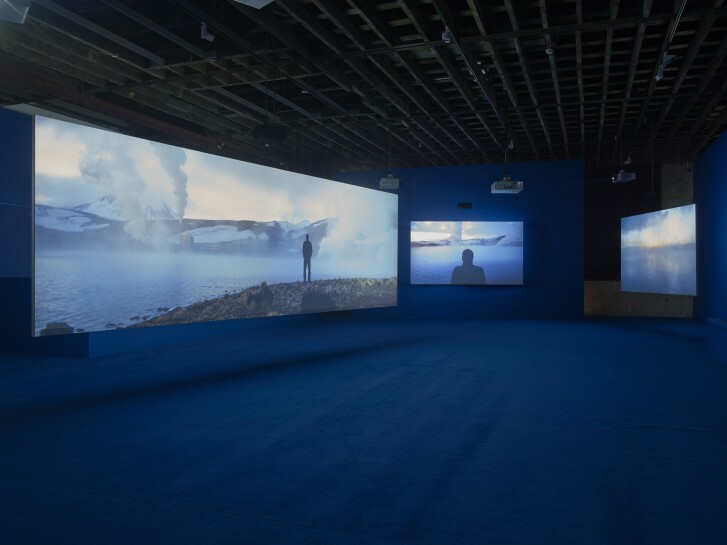 The presentation of these highly acclaimed works by Isaac Julien in San Francisco provides a unique opportunity to engage a wide audience from the Bay Area’s diverse local communities and to address salient political, cultural, and social issues that affect us all, but in vastly different ways. Julien’s visually stunning, multi-perspectival installations chronicle compelling stories of financiers and migrant laborers, art world players and domestic workers that resonate poignantly with both the prosperity and inequality arising from the innovations of the high-tech economic sector. A post-2008 spin on Jacques Tati’s 1967 film of the same name, Playtime unfolds across three capital cities—London, Reykjavik and Dubai—that have been extensively reshaped by the recent volatilities in the global financial system. Playtime’s cosmopolitan spectacle, presented in a kaleidoscopic montage across seven large screens, interconnects the lives of its archetypical characters—hedge fund managers and art world players in London; a photographer in Reykjavik; and a Filipina houseworker in Dubai—each of whom is based on a real-life individual directly affected by the market collapse. Julien visualizes the potential of capital to both create social mobility and produce obstacles to it, foregrounding the way each character inhabits and traverses the sweeping high-tech cityscapes, contemporary architecture, and sublime natural landscapes of these worldly locales. On view in Gallery 308. As part of his preparatory research for Playtime, in 2012 Julien produced a public talk at the Hayward Gallery in London, in which the artist addressed the problem of representing the invisible flows and relations of capital with world-renowned Marx scholar, David Harvey. “It’s a bit like gravity,” Harvey explains, “it’s a very powerful force; it’s a relationship which makes things happen… you can really only intuit that capital exists by its effects.” Deftly editing the rich and insightful conversation that follows with a fast-paced montage of telling moments from film and media history, Julien and his audience of invited scholars illuminate many of the driving forces and felt repercussions of 21st century capitalism. During KAPITAL’s creation process Julien described, “As I cannot film the thing itself, capital, I hope to film its shadow: its effects, its movements and the social relations it creates.” KAPITAL went on to be prominently featured at the 2015 Venice Biennale and has complimented Playtime at many other venues world-wide. On view in the SFMOMA Artist Gallery. A nighttime coast guard emergency call and rescue helicopter footage from the 2004 Morecambe Bay tragedy, in which 22 Chinese cockle pickers perished in the rising tide off the Northwest coast of England, sets the scene for Isaac Julien’s poetic meditation on what drives people to search for a “better life”. Over four years, Julien researched contemporary and historic Chinese culture and collaborated with many of China’s leading creative talents, including film stars Maggie Cheung and Zhao Tao, poet Wang Ping, and media artist Yang Fudong. Filmed in both contemporary and historic Shanghai, and in the breathtaking subtropical mountains of Guangxi province, the visually luscious video interweaves contemporary struggles of daily life with ancient mythology and historical artistic forms. A central figure is the ancient Goddess Mazu, protector of seafarers—a powerful deity in the legends of Fujian, the native home of the lost cockle pickers. In “Better Life” Mazu bears witness to the contemporary tragedy of Morecambe Bay through parallel stories of wandering fishermen in the 15th century Ming period and the making of the film The Goddess (1934) in modern Shanghai. On view in the Gray Box Gallery, San Francisco Art Institute Fort Mason Campus.